1917, 1¢ green, imperf between, three horizontal pairs in a right margin plate block of 15 (positions 57-58, 67-68 & 77-78), o.g., never hinged, P.O. fresh with rich deep color, Very Fine and choice, one of the Finest Plate Block Format Multiples of the 1917 1¢ Imperforate Vertically Between Variety; with 2013 P.S.A.G. certificate. Scott No. 498b $4,050 for three pairs. 1917, 3¢ light violet, type I, imperf horizontally, vertical pair, o.g., lightly hinged, choice centering with in wide margins, bold bright color, Extremely Fine to Superb, a rare imperforate error, with only 25 pairs issued; with Ward handstamp, 2014 P.F. and 2014 P.S.A.G. certificates, the later Graded (95). CONSIDERED TO BE THE FINEST EXAMPLE OF THE 1917 3¢ TYPE I IMPERF HORIZONTALLY EXTANT. 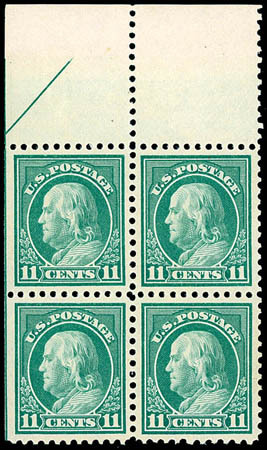 1917, 11¢ light green, transitional perf 10 at bottom, bottom left stamp in a top margin part arrow block of 4 (natural s.e. at left), o.g., never hinged, exceptional centering especially variety which is framed amid large balanced margins, rich color, Extremely Fine to Superb, a wonderful position piece; with 2011 P.S.E. Graded certificate (XF-Sup 95). Scott No. 511a $7,500 for single. WITHOUT QUESTION ONE OF THE FINEST EXAMPLES OF THE 1917 11¢ TRANSITIONAL PERF 10 ISSUES. 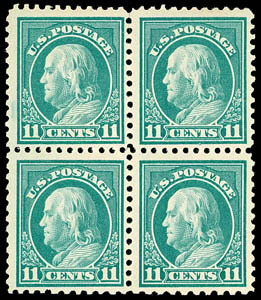 1917, 11¢ light green, transitional perf 10/11 and perf 10 at bottom, bottom stamps in block of 4 (transitional stamp at left), o.g., never hinged, wide margins, rich color, Very Fine; with 2000, 2007 and 2014 P.S.E. certificates. Scott No. 511a $15,036 for singles. A WONDERFUL AND VERY RARE NEVER HINGED EXAMPLE OF THE 1917 11¢ FRANKLIN ISSUE SHOWING BOTH THE TRANSITIONAL PERF 10 & 11 AND PERF 10 AT BOTTOM IN A MULTIPLE WITH NORMAL. 1919, 1¢ gray green Offset, perf 12½, imperf vertically, corner margin horizontal strip of 3, o.g., lightly hinged, exceptional centering within wide margin, bright color, Extremely Fine, a rare and undercataloged variety; with 1990 P.F. and photocopy of 2010 P.F. certificate for a block of 6. Scott No. 536a $1,200 for pair. 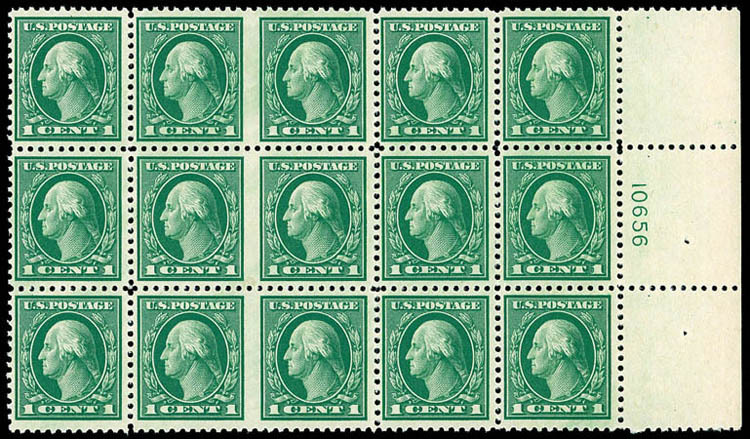 1921, 1¢ green, rotary coil waste, imperf between, left pair in a corner margin horizontal strip of 3, full o.g., imperf pair exceptionally well centered with evenly balanced margins around, bold color, Extremely Fine and choice, of of the rarest imperf between errors, ex Whitman and "Sirron"; with 2011 P.F. certificate. Scott No. 543a $5,000 for pair. REGARDED AS THE FINEST EXAMPLE OF THE 1921 1¢ ROTARY COIL WASTE IMPERF BETWEEN VARIETY - WITH ONLY FOUR SUCH PAIRS RECORDED. 1934, 3¢ Wisconsin, imperf vertically, left margin horizontal pair, o.g., never hinged, fresh and pristine with wide margins, rich color, Superb, very scarce with approximately 80 pairs reported; with 2013 P.S.A.G. Graded certificate (98). WITHOUT QUESTION ONE, IF NOT THE FINEST EXAMPLES OF THE 1934 3¢ WISCONSIN IMPERF VERTICALLY ISSUE EXTANT. 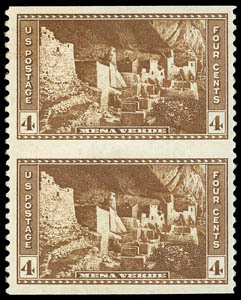 1934, 4¢ Parks, imperf horizontally, vertical pair, o.g. with a post office paste up covering a portion of the gum, fresh with rich color, Very Fine and rare, only 15 pairs issued and all except 4 pairs bearing the paste up on reverse; with photocopy of 1976 P.F. certificate and 2013 P.F. certificate. 1934, 5¢ Parks, imperf vertically, left margin horizontal strip of 3, o.g., never hinged, choice centering within wide margins, bold vivid color and exceptional freshness, Extremely Fine; with 2012 P.F. certificate. Scott No. 744a $4,000 for pair. ONE OF THE FINEST CENTERED EXAMPLES OF THE 1934 5¢ PARKS IMPERF VERTICALLY ERROR. 1934, 7¢ Parks, imperf vertically, left margin horizontal pair, o.g., never hinged, well centered within wide margins, deep color, Extremely Fine to Superb, an exceptional pair; with 2013 P.S.A.G. Graded certificate (95). ONE OF THE FINEST EXAMPLES OF THE 1934 7¢ PARKS IMPERF VERTICALLY ERROR IN PRISTINE NEVER HINGED CONDITION.